I know you are super busy planning your Big Day and the last thing you want is another item on your Wedding To-Do list but listen up. You should consider yourself lucky that you stumbled upon this guide because most brides don’t think twice about their posture and far too many hunchback brides walk down the aisle. Think of all the time and energy you will put into getting ready for your big day. Months of dieting and grueling bridal bootcamp fitness classes to slim down and tone up. And then on the big day you slip into your beautiful dress with your polished nails, gorgeous hair and make-up and Yikes… where did those unsightly rounded shoulders come from? The good news is that correcting your rounded shoulders and faulty alignment is quite simple, is done quickly and cost-free. 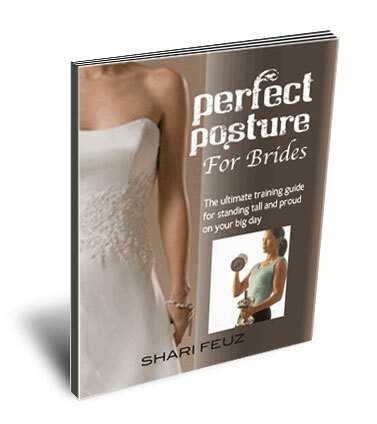 Posture for Brides guides you every step of the way. Whether you are 1, 3, 6 months or a year out from your big day you can start today and take significant steps towards standing tall and proud. Simply by correcting your posture you will flatten your stomach, you will appear leaner, more athletic and more confident. Your dress will hang beautifully and you will glow! May you be radiant on your Big Day! Posture for Brides is a Radiance Wellness publication launching Summer 2017. You can help me make it awesome. Would you like to be one of the first to receive a free review e-copy of Posture for Brides?